Decorate your floral bouquet with these elegant flower picks. Each is on a 5" wire that slides into the bouquet. 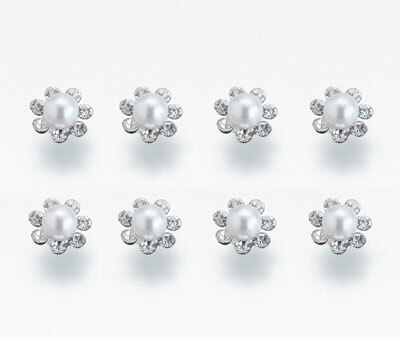 All eight picks are decorated with a pearl in the middle and a series of rhinestones surrounding the pearl. 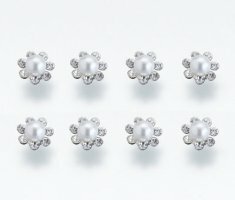 Both pearls and rhinestones are set on silver plating. Also available in rhinestone and rhinestone flower versions. Complete your Bridal or Prom look with the perfect accessory from The Ribbon Diva.